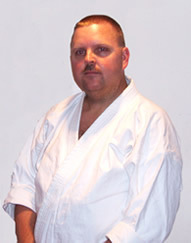 Scott Vance (NanaDan - 7th Degree) started his Martial Arts training in August of 1979 at the Y.M.C.A. in Fairborn, Ohio under the instruction of Sensei Terry Bryan. The style was mainly Shorin-ryu with some Tae Kwon Do and Muay Thai Influences. Sensei Bryan brought in many guest instructors such as Sifu Manuel Taningco (Shaolin Chuan Ssu Kempo & Arnis), Sifu Tyrone Jackson (Monkey & Praying Mantis Styles) and Sifu Mustafa Kenyatta (Tai Chi & Five Animal Systems). In June of 1983, Sensei Vance earned his Black Belt from Sensei Bryan in American Kenpo. Sensei Bryan's American Kenpo included teachings from Tae Kwon Do, Hapkido, Motobu Shorin-ryu, Isshin-ryu, Judo, Chinese Kempo, Arnis, Muay Thai, and Kung Fu. Sensei Bryan moved to Colorado in 1983 and the School was turned over to Sifu Kenyatta. Sensei Vance instructed classes for Sifu Kenyatta in Karate, Judo, and Kung Fu for the following two years. He also continued his Kung Fu training under Sifu Kenyatta. In 1985, Sensei Vance joined the U.S. Army and was stationed at Ft. Campbell, Kentucky. He joined the Martial Arts Club on base and continued training with several instructors in Tae Kwon Do, Karate and Judo. In 1987, Sensei Vance was stationed in Bayreuth, Germany where he trained with a fellow serviceman in Shotokan Karate. The two of them also attended a local Judo club at a German school downtown. In 1988, Sensei Vance was discharged from the military and returned to Fairborn, Ohio were he help start a new Dojo at the Y.M.C.A. with Sensei Dennis Toomey who is fellow black belt under Sensei Bryan. He also began learning Shorin-ryu karate from Sensei Doug Yates. In 1990, he left the Fairborn School to begin learning and teaching at the Doug Yates Karate School in Xenia, Ohio. Also in this year he started his career as a police officer. In 1991, He met and began training with Grandmaster Yuichi Kuda in Matsumura Kenpo Shorin-ryu and Kobudo and continued learning with Sensei Kuda until his death in 1999. Sensei Vance was also a student of Master Sonny Johnson (Sensei Yates teacher) until his passing in 2013. Sensei Vance continues his training today under Master Doug Yates, as well as Sensei Johnson's teacher Master Roy Thomason. Sensei Thomason studied Shorin-ryu karate in Okinawa, Japan in the 1960's under Sensei Fusei Kise and Grandmaster Hohan Soken of Matsumura Seito Shorin-ryu and Kobudo. Sensei Vance teaches the instructors class on Friday nights where he shares his passion for Kobudo (traditional weapons training), traditional / non-traditional structure, and practical application.